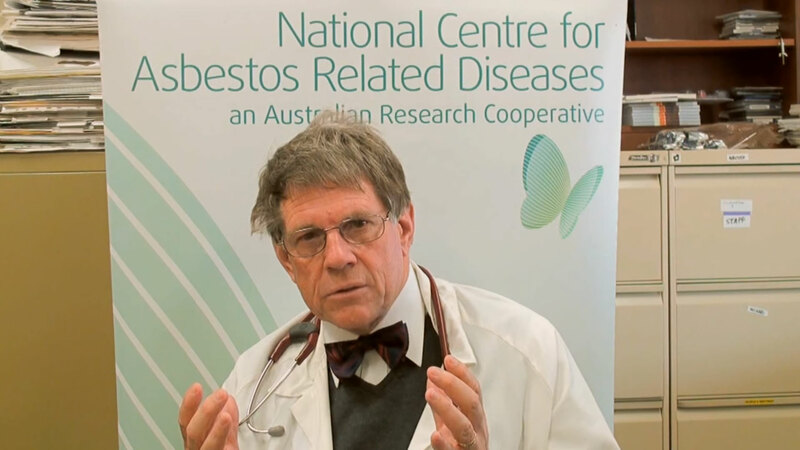 Diagnosed with mesothelioma asbestos cancer, or another asbestos related disease? If you or a loved one has been diagnosed, this section is for you - we're here to help. Information about mesothelioma, diagnosis, treatments and surgeries. Information about asbestos related diseases other than mesothelioma. 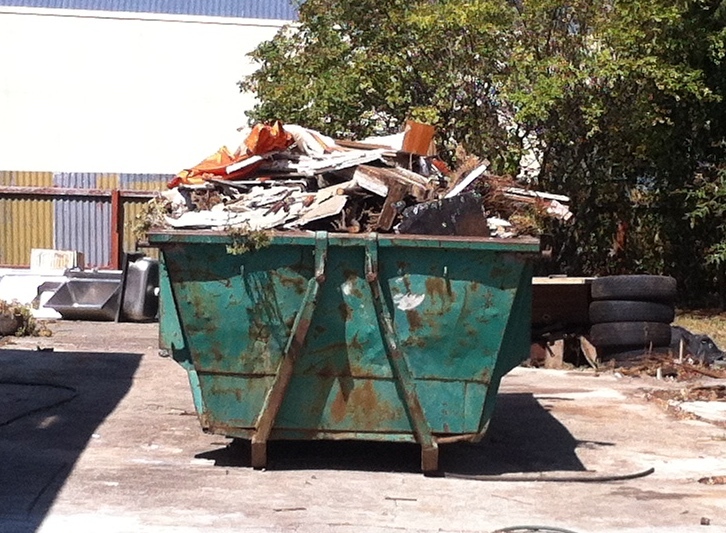 Find out about asbestos in Australia, its dangers & how to manage the risk. 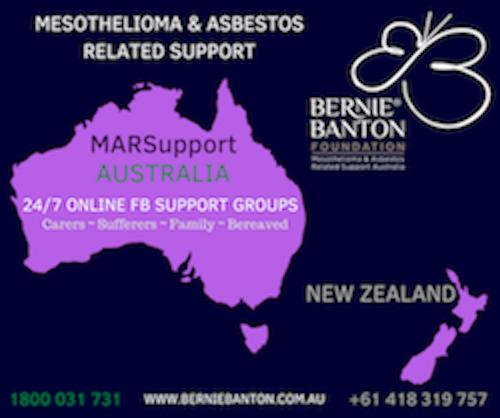 The Foundation’s Mesothelioma and Asbestos Related Support Australia (MARSupport) offers person to person (telephone), face to face peer-based information, referral, advocacy and emotional support for those who have been diagnosed with mesothelioma asbestos cancer or another asbestos related disease, their carers, immediate family members and for those bereaved. 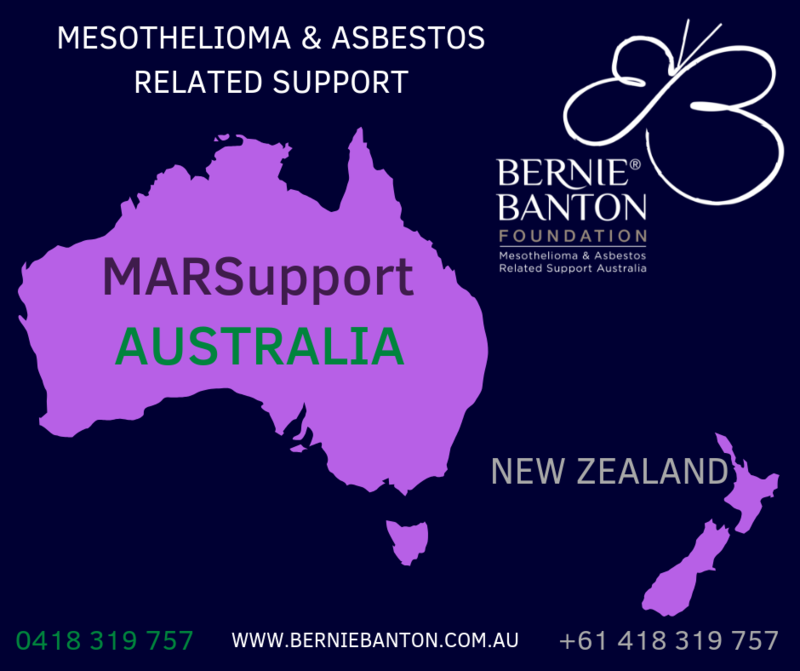 MARSupport operates across Australia and is available to New Zealanders via our Asbestos Disease Helpline and online support chat room groups, and information pages. To find out about our support services [click here]. If you are seeking asbestos awareness information please go to the Asbestos Awareness Information section on the Foundations website. 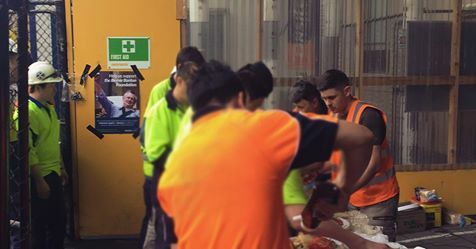 Greencap, a Bernie Banton Foundation Corporate Fundraising Supporter, sponsored a BBQ for workers at a large urban construction site in Melbourne. A big thank you to Greencap, and all who attended for their generous donations. Their contributions will assist the foundation with much needed awareness, support and advocacy to sufferers of asbestos- related diseases and their loved ones. I would like to express the gratitude that my family and myself feel for the support and direction you have provided to us over the last few months. All of us in the family are so grateful for your guidance and advice during this emotional time. We all certainly believe that without it we wouldn’t be in the positive position that we are in now with regards to his treatment and support services. Dad and I both agree that by knowing who to see and what to do straight off the bat, we all felt that we had some sort control of the situation and were not feeling as hopeless and lost at sea as we may have otherwise felt. From the entire family we thank you. With the fabulous support of Rod and Karen we were linked in with the DDA. Thankfully they covered 24 rounds of Keytruda for dad which worked amazingly until approx 8 weeks before his passing. We cannot praise Rod and Karen enough as they were there for dad and our family from the start. Without these amazing people we don’t really know how we would have coped. Even since the passing of dad they have been there to support us and offer advice. If you and your family have the capacity to donate to this amazing foundation so they can continue to provide the support they do I am sure they would appreciate it. They do not ask for donations but it helps them immensely as they run on the smell of a oily rag. To Rod and Karen we are forever grateful for what you have both done for dad and our whole family, you are both God’s gifts in our eyes. Rod & Karen are the most amazing people & we thought that donations to the foundation in lieu of flowers were more beneficial so they can continue the wonderful work they do. I am just putting this out there… I am so grateful and happy that a) I came across the foundation and thus Rod Smith and b) the fact I was introduced into this group. I was feeling so isolated in the early days of this journey and joining this group made so much difference on a daily basis to me. I have somewhere safe to vent if I need to, I see that others are feeling the similar feelings I am, I was comforted ( sadly so) that we are not alone, and I have a real feeling of having joined a community. I am a firm believer of support groups, this one has proven to be the ace of spades.I am sorry of course we met in these circumstances, but I am glad that each one of you is in the circle.. Regardless of how each of our journeys progresses, it’s good to know there is always someone out there…..
Colin and our family had wonderful support from this amazing group. Please support them. Again Rod on behalf of the family we greatly appreciate your support and that of Bernie Banton Foundation. The work and support you provide to the sufferers and family’s is exceptional and means a lot to all involved with this terrible disease. Well my mind thanks Rod Smith and Karen at the Bernie Banton Foundation for listening. Thank you so much. Many thanks for all your support help and kindness…it is so very much appreciate it. Many thanks Rod. A big hug to you and Karen: you are both truly FANTASTIC! Thank you so much for your email, advice and ongoing support during our journey with pop it is greatly appreciated!! I look forward to talking to you some more very soon. 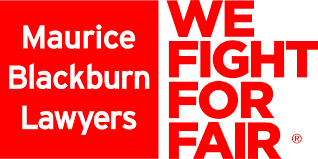 Thanks for putting us onto the lawyers they have been outstanding and what a wonderful group of people to deal with. Extremely professional, considerate and understanding. Hi Rod, thanks again for your generosity the other day, your time, words + patience were very much appreciated. Just a note to say thank so much you for your time yesterday. It was good to talk to someone about my mesothelioma situation. After I got off the phone I said to my wife that there was a real sense of calm and empathy in talking with you both. Lost my beautiful Dad 3 months ago… 6 months after diagnosis… still young. He and my mum have been helped by your work… we couldn’t have a cure … or even treatment… but dad knew that his beloved wife of 50 years would be as OK as possible…. Many thanks for your expert guidance and support which were invaluable in putting me on the right road after I was diagnosed with mesothelioma. Your expertise gave me the knowledge and stability to unscramble my bewilderment the diagnosis caused. Thank you sooooo much for your call yesterday – I cannot thank you enough for your support! Up till now I felt as if I was a very lonely voice in the desert without the ability to REALLY talk to my husband and family in depth (about my fears etc.). Thank you for spending time with me today and later speaking to my friend concerning his journey, offering him details of services that we weren’t even aware of. He rang me to say how impressed he was with your understanding and assistance and how much better he felt in himself. He and his wife were very much comforted by knowing you would be there for them beyond today’s advice. His wife was especially relieved to know someone experienced and knowledgeable is out there to empathise and help her through their journey. Please know that you and your Foundation are very much appreciated. Wow thank you. That is an amazing summary of the current state with the use of Keytruda for the treatment of mesothelioma. Thank you for demystifying everything for me. Very interesting reading. It is great that you have access to this information and I really appreciate your help to date. Just letting you know that I received a big ‘thumbs up’ from dad’s oncologist following his review of your very comprehensive summary of Keytruda. He said that the document was very helpful and applauded you for putting it together. Are you happy for me to send this on to dad’s GP and Physio etc? Thanks so much for your help over the phone today, means the world to me. Without you as my lifeline mums and my journey would have been very different – thank you. Thank you for your wise and sensitive words and thoughts. You are so right. Hope all is well with you. Stay safe. Thank you and Rod for your support. Thank you so much for all the information that you sent me last night. I will follow up on it on Monday with both the Oncologist and the Solicitor. Your help has been invaluable and saved me a great deal of time and stress. I loved our chat and hung up knowing in my heart that we had support and were not alone in this. It means a lot. This is to say thank you once again for taking my call back in Dec 2013 when my husband was diagnosed. You were a great help to give me the name of the Doctor in Sydney. Once again thank you. Thank you very much for your kind and supportive email. It is such a comfort to know that your foundation is there to help us. Thanks so much for your support with dad as he bravely fought against mesothelioma. You and Karen do such a wonderful job in providing information and support to those that are in a time of need. I know that our family really appreciated the time you took speaking with us when any of us needed someone to talk to. Thank you! I want to thank you on behalf of everyone affected by mesothelioma for the excellent work and support you are doing for the community. Thank you so much for the time you have spent talking to us, I know my sisters and I are comforted by the fact that we have someone to talk to. Thank you for taking the time to speak with me earlier on today. My husband and I appreciate all your information , honesty and sincere words of support. The information that is available on the Bernie Banton Foundation website is great – very informative, thank you. Continuing from our earlier conversation, many thanks for the time you took to talk to me truly appreciate it. Thanks to you and Karen for taking the time to speak with me tonight. We very much appreciate your advice. My family and I have been comforted by what you have shared, and we sincerely appreciate the work and dedication of you both. Thank you so much for your call last night. It was very comforting to speak openly with you about our situation. Thank you so much for your time on the phone earlier this evening and for sending through this information. It is very much appreciated. I hope you, Karen and your families had a lovely Christmas. Thank you for speaking to me on Christmas Eve, it really helped with what I was experiencing at the time. Thank you so much for your kind words and the assistance that you so generously provide for everyone, you are doing an amazing job. Last year I contacted you after my husband, was diagnosed with pleural mesothelioma, your advice was invaluable. My darling husband lost his battle last Monday morning. Some of my family members have asked me if I would rather they donate to a cause rather than send flowers. If it’s OK, I would like to advise them to donate to your Foundation. You both came on the line when we spoke and were so supportive and helpful I relied on you when things got quite hairy in the week or so preceding Dad’s death. Yes, you continued to help me after we hung up – I called on that connection within myself. Thank you both. A great person to have in your corner when it gets tough. Thank you Rod for caring about our dad. Thanks, once again, for your caring, listening ear. You are a fount of very helpful info, may be write it all down for people like me and their families. All in God’s safe hands. Every blessing to you all in your wonderful work. 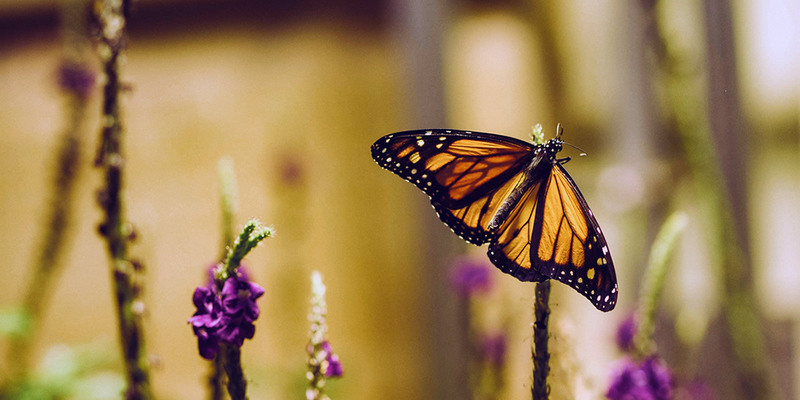 Thankyou for your time and support on the phone a little while ago…I lost my Dad to peritoneal mesothelioma in June 2002, we are sorting things out for Mum and will be lodging a post-mortem claim, and await the outcome. Hope you and Karen are going well. I just wanted to say thank you, your words of wisdom a couple of years ago made me make the right choices with dad and how I dealt with it. It’s been tough, but I’m glad I can live knowing I have no regrets about it. We are extremely proud and passionate about the support and information we provide at the Bernie Banton Foundation. We so appreciate the kind words people say about not only us, but the Foundation as a whole. Please click on the side arrows to scroll through the testimonials. Access the latest information about mesothelioma and asbestos related diseases; the Foundation’s support services; the Foundation; and asbestos awareness, via the Foundation’s information and news Facebook Page Streams [see below – you do not need to be a member of Facebook to view each Facebook Page site and its postings]. Simply ‘hold’ on any section of the Facebook text area and then scroll the posts up or down the page to view or read each post, or click on the Facebook title to go to the actual Facebook page. If the post contains a news article, and you want to read it, click on the body of the article or its’ image. Please support those who assist the Foundation to provide support and patient advocacy, and create awareness of mesothelioma asbestos cancer and other asbestos related diseases. 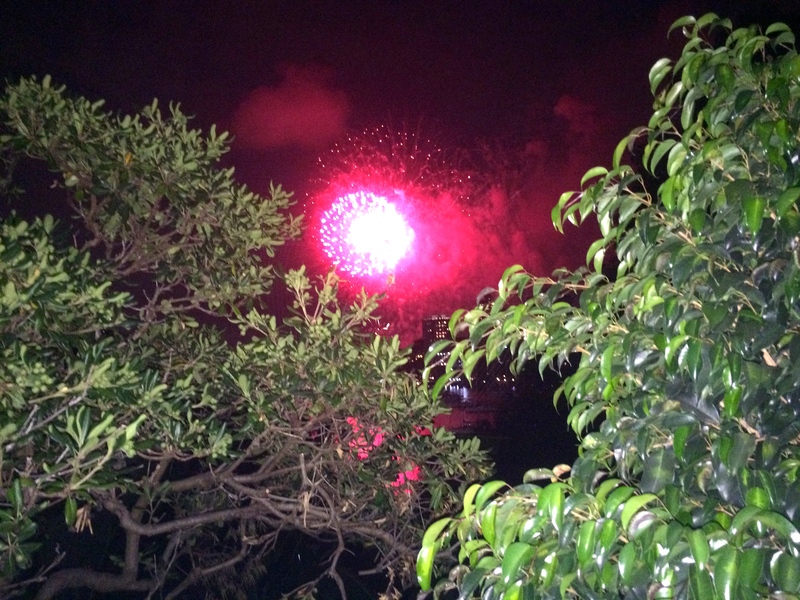 A special thank you to all who donate to the Foundation and support those organising and participating in fundraising. In Western Australia we partner with RTR to supply local support and awareness.